ELYSIUM’s Black & Red Spaceship? A 2154 Bugatti! What was that sleek black and red spaceship in the movie “Elysium“? You know, the one John Carlyle (William Fichtner) commutes back and forth from his office on Earth to his heavenly home? It’s the 2154 Bugatti, of course. Did you miss the “EB” logo? No word on the 2154 M.S.R.P. for a new Bugatti, but it’s got to be significantly more than the 2013 model, which goes for something like $2.4 million and change. Wonder how much a blown engine will cost to fix? The Elysium Bugatti, in the dual-color scheme typical of the company’s Veyron supercar, was actually spotted in San Diego at this year’s Comic Con, where it drew quite a crowd to the place where it was suspended above the ground. Seriously, the average moviegoer could be excused for missing the Bugatti (or the Versace-branded wellness units on Elysium, or Jodie Foster’s Armani wardrobe). The movie doesn’t go out of its way to highlight product placements. Because director Neill Blomkamp said companies weren’t interested. “Not a single brand came forward,” he told a media gathering prior to the movie’s premiere. Bugatti, in fact, originally turned him down. “Bugatti said no and then I wrote this impassioned email and they eventually said okay,” Blomkamp said. Would Ettore Bugatti, who founded the company in 1909, be turning over in his grave, with his creations now depicted as space ships? “No,” I don’t think so,” said Emanuela Wilm, general manager of marketing for Bugatti of the Americas. She told the Wall Street Journal that spaceships would probably be consistent with the founder’s vision of facilitating high-speed human transportation. “In 2154, it could well be that there is a flying Bugatti,” she said. In fact, Bugatti has become comfortable with the concept of its cars appearing in science fiction movies. Look for the Bugatti Grand Sport Vitesse, currently the world’s fastest car with a top speed of 258 m.p.h., in the upcoming fourth installment in “The Transformers” series. I thought the entire idea of a motor company building spaceships wasn’t far fetched. Nor – an ultra-luxury car company which builds the world’s fastest, most powerful car. 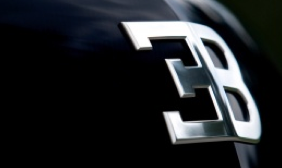 I thought the placement of the Bugatti Logo was quite interesting to help show you exactly how rich the CEO was. No one else had one – if you noticed! It’s now part of the annual Christmas display at Dunkel Bros. in La Mirada, CA. You can see it just off of the 5 Freeway Southbound side.